I came into this world around the same time that Dr. Martin Luther King, Jr., a young minister, made history by leading the Montgomery, Alabama, bus boycott. That movement led to the Supreme Court ruling that segregation on public buses is unconstitutional. During my earliest years I attended a segregated school in Virginia where I lived with my grandparents, who had been poor sharecroppers. My parents had made the great migration, as did millions of African Americans, to seek work and a better life for their families. Calling 1199 his favorite union, Dr. King added, “If all of labor would emulate what you have been doing over the years, our nation would be closer to victory in the fight to eliminate poverty and injustice.” Dr. King thanked 1199 for its principled struggles against economic exploitation, racism and militarism— the interconnected evils that he, too, fought mightily against. I don’t mention Dr. King’s praise of our Union as a boast, but as a challenge. Throughout our Union’s history, we have risen to that challenge by picking up his torch and following the path he forged. His example and teachings are as relevant today as they were a half-century ago. That is why I refer to him as our Union’s North Star. 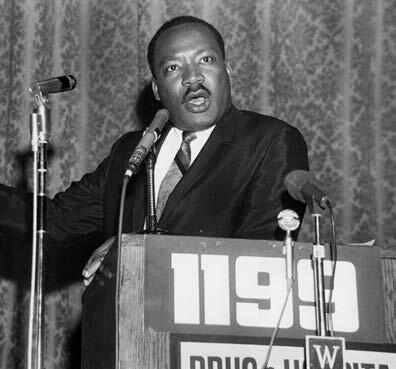 Political leaders and pundits highlight Dr. King’s nonviolence and love of humankind. Those qualities cannot be denied. But Dr. King was much more. He was a drum major for justice, an exceptional organizer who used civil disobedience to both build a powerful movement and rouse the nation’s conscience. And I am proud that our Union stood with him during challenging moments when he courageously took positions on foreign and domestic policies that others— including civil rights allies—harshly criticized. Few have done more to call our nation to its highest ideals than Dr. King. Thankfully his work continues, most importantly through the Rev. William Barber and Dr. Liz Theoharis, leaders of the 2018 Poor People’s Campaign—a revival of Dr. King’s movement a half-century ago to bring about a radical redistribution of economic and political power. We can pay Dr. King no greater honor than to further those causes for which he gave his far-too-short life.